Ok guys, here it is. I gave up on the original alpha because I messed with it to the point of no return. Lol. It was easier to start over with a fresh alpha so I decided to try working with my old Disco alpha’s, since they would work well with lots of colours. Basically what you have here is an Eyeshadow and Blush set. They must be used together in order to achieve the looks I’ve shown below. 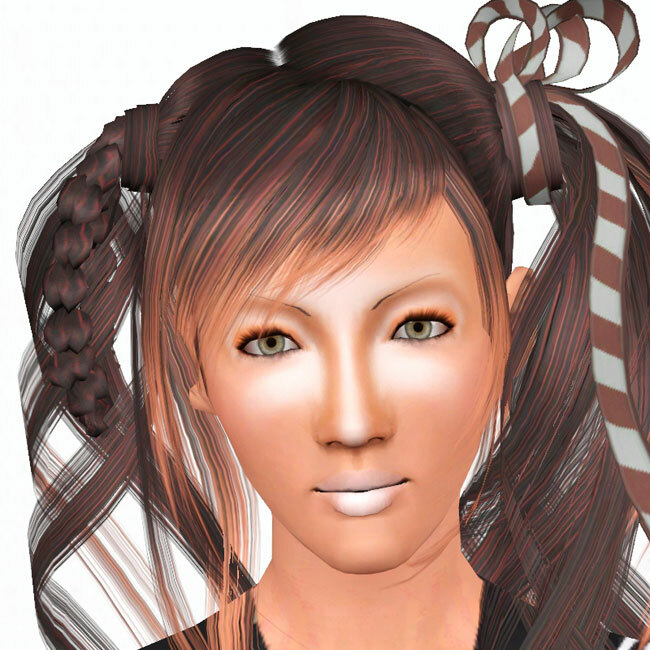 That said, you could try combining the Blush packages with other eyeshadows and see what happens heh. NOTE: These MUST be applied blush first then eyeshadow second!! 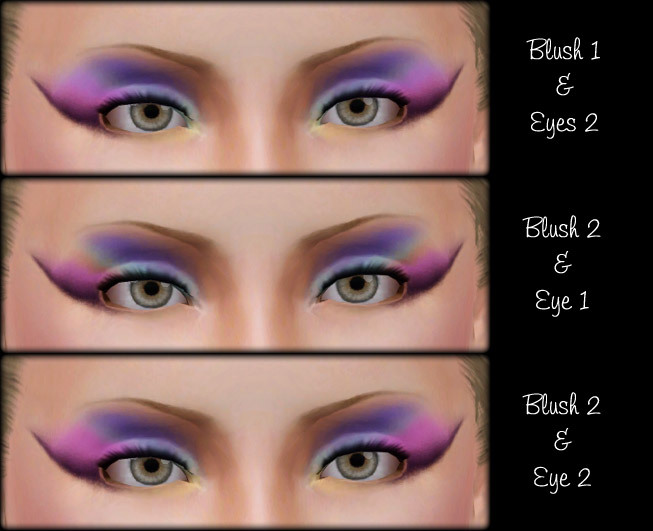 You want the eyeshadow layer on top, otherwise you will get slightly different looks to the ones below. As you can see from the image above, you can achieve a few different looks by using different Blush and Eyeshadow combinations. Below you can see the separate files. The eyeshadows cover from the eye socket down to the bottom lid and have three channels. The blushes cover the upper half of the eye just below the brow and also have a blush. These also have three channels so, basically you end up with a 1-channel blush and a 5-channel eyeshadow. Below are some more examples of colours. I tried to darken the alpha around the eyelids so the eyeliners would work, they appear to be working ok. Whether or not that is because of the way I did the alpha or because of the way you layer the blush/eyeshadow I don’t know. Who cares really, as long as it works lol. Ok I’m going to explain how to make these a little later, this took me all day so I can’t be buggered right now. Hopefully tomorrow or the next day I will have a tutorial on combining alphas/masks for you so you can make your own multi channel makeup combos. 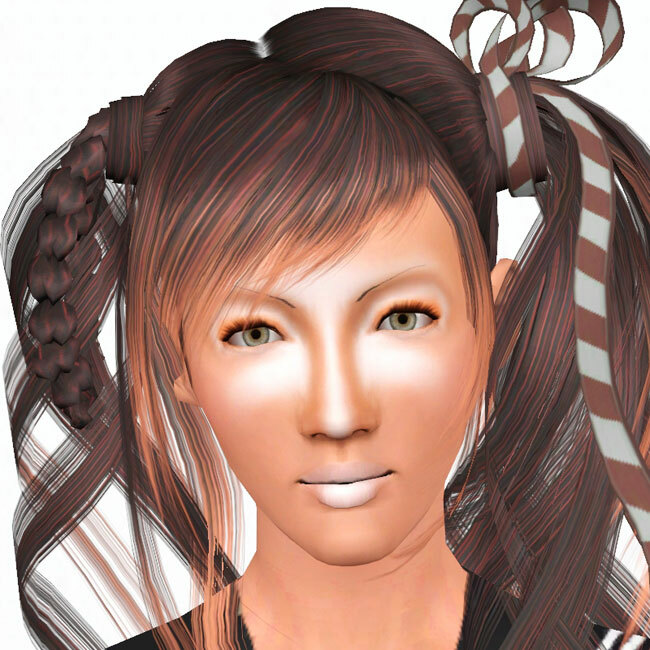 Hey guys, I wanted to make some crazy Ganguro makeup… so I did. This is an eyeshadow for females and males. Teen-Elder. I tried to make it so that you could still use basic eyeliners with it if you mess with the opacity slider. You won’t be able to use plumed eyeliners because of the layering issue with multi-channel eyeshadows, but at least the basic ones work. This is without eyeliner. I’ve just used a random Lemonleaf lipstick and made it white. Those eyes are escand’s oh my eyes and the eyebrows are simmiller’s. The hair and accessory are by Anubis. You can see some with eyeliner in the gallery. Oh, my mum is visiting so I might not be updating this as regularly for the next couple of weeks. Hey guys, I felt like making something quick and simple so I whipped up a few blushes for you. These are pretty basic blushes, nothing spectacular. 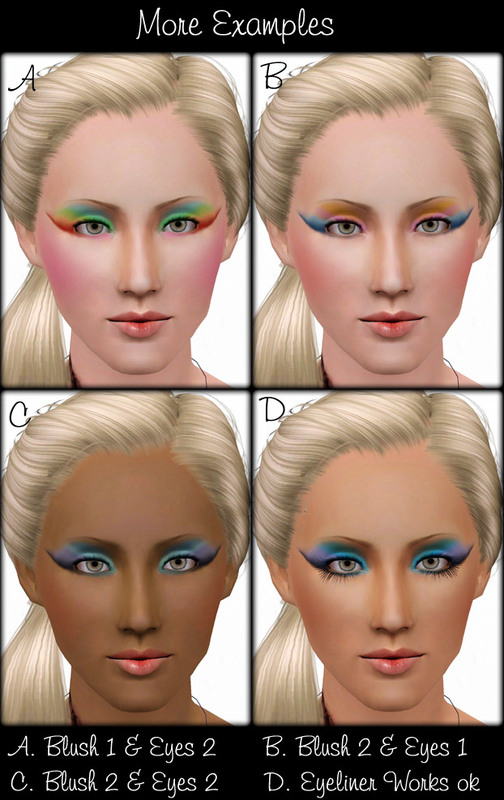 I have noticed, when making sims, that most blushes cover the edge of the cheekbones and not the apples. When they do cover the apples they always seem to come with chin and forehead blush or some kind of nose shine. I noticed that I took the blush up quite high and it was very close to the nose. It did, however, work well with the Opacity slider – you could have quite dark coverage or very subtle coverage, in which case you couldn’t tell that it was encroaching upon the eyelids – so I kinda liked it despite the large spread. You can see it’s a smaller spread, a little further from the nose and eyes but still covers the apples of the cheeks. It works well with the opacity slider as well so I was pretty happy with it. 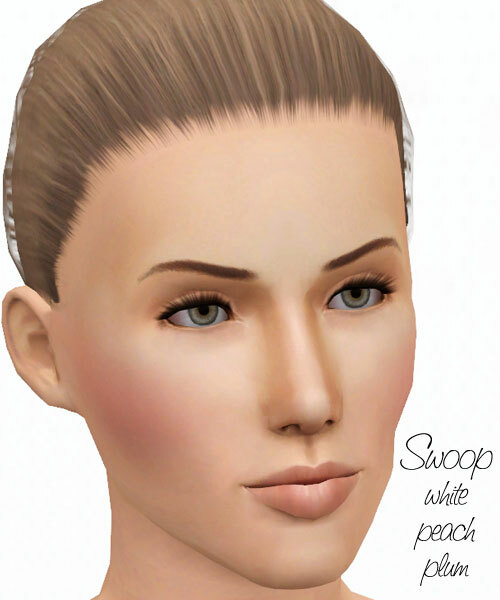 This is probably not the best angle to show off the shape of the blush but there are more shots of it in the gallery where you can see the channels as well.